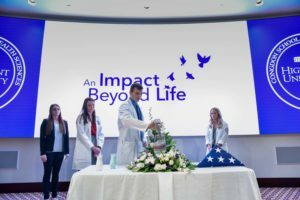 Students, faculty and staff of High Point University’s Congdon School of Health Sciences gathered for ‘An Impact Beyond Life’ memorial service. 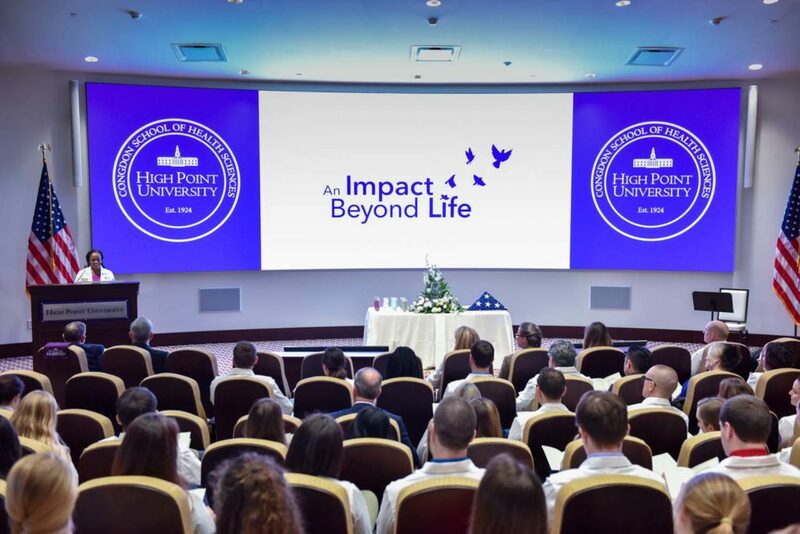 HIGH POINT, N.C., Jan. 18, 2019 – Students, faculty and staff of High Point University’s Congdon School of Health Sciences gathered for “An Impact Beyond Life” memorial service today. 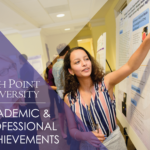 The service honored the 22 donors who helped educate HPU students in the 2018 year through the Willed Body Program. Students from each program poured sand into a vase to symbolize the beginning of the journey and combined experience gained from the Willed Body Program. 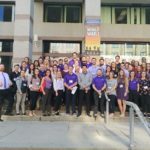 Pictured from left to right are HPU’s Erin Kellogg, athletic training student; Sarah Miller, exercise science student; Zachary Schall, physical therapy student; and Melissa Fellmeth, physician assistant student. 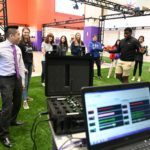 HPU students from each of the three Health Sciences graduate programs – physician assistant studies, physical therapy and athletic training – and undergraduate students in the exercise science program presented to the group what their donor meant to them. The state-of-the-art anatomy lab is located on the fourth floor of Congdon Hall, where students are introduced to these very first patients. 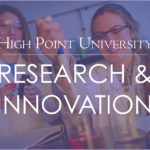 Through this program, donors contribute to the education of future health care providers in HPU’s academic programs while also receiving a high level of care in their end-of-life planning. “We honor the 22 silent teachers and their families for bestowing the gift of anatomical education, compassion, respect, dignity, professionalism, patience and so much more within the minds and hearts of our students,” said Amanda Mittelstadt, HPU’s Willed Body Program director. Students from each program poured sand into a vase to symbolize the beginning of the journey and combined experience gained from the Willed Body Program. That vase will be on display in the Willed Body Program lobby on the first floor in Congdon Hall.